The optical networks research group at Connect had 4 papers accepted at the 20th IEEE Optical Network Design and Modeling conference (ONDM) at Cartagena in Spain recently. One paper co-authored by Frank Slyne under the supervision of Prof. Marco Ruffini at Trinity College Dublin was awarded Best Student Paper. 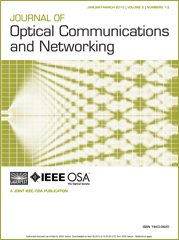 The authors have since been asked to submit an invited paper to the Journal of Optical Communications and Networking (JOCN). JOCN is a joint publishing effort of OSA and IEEE. The authors of another Connect paper, a collaboration with Telefonica in Madrid and the CTTC telecommunications research centre in Barcelona and related to the Discus project, have also been invited to submit to the same journal. Connect researcher Frank Slyne was heavily involved in this work. The next Optical Network Design and Modeling conference will be hosted by Connect in Dublin in 2018.